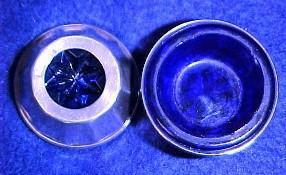 One cobalt glass insert with star on the bottom fits in a marked sterling silver holder with a turned lip and 12 lines bottom to top. Two open salts are available. "We accept Visa, MasterCard, Discover and American Express via Paypal, or payment with a money order or check. We will ship within 24 hours if paid with a money order or Paypal. Payment with a check will delay shipping." Items Similar To "Sterling Cobalt Open Salt Dip - Glass"